TTF’s Philly Team hosted a Storm Drain Marking event with the Philadelphia Wooden Boat Factory and students in their RiverGuides program on Friday, October 14th. We began our event by testing their knowledge, followed by a quick lesson about watersheds through our Watershed Heroes presentation. The students learned what a watershed is, how many watersheds are in the city, and what the city is doing to protect their watersheds through the Green City, Clean Waters initiative, as well as how we can protect our waterways through storm drain marking. 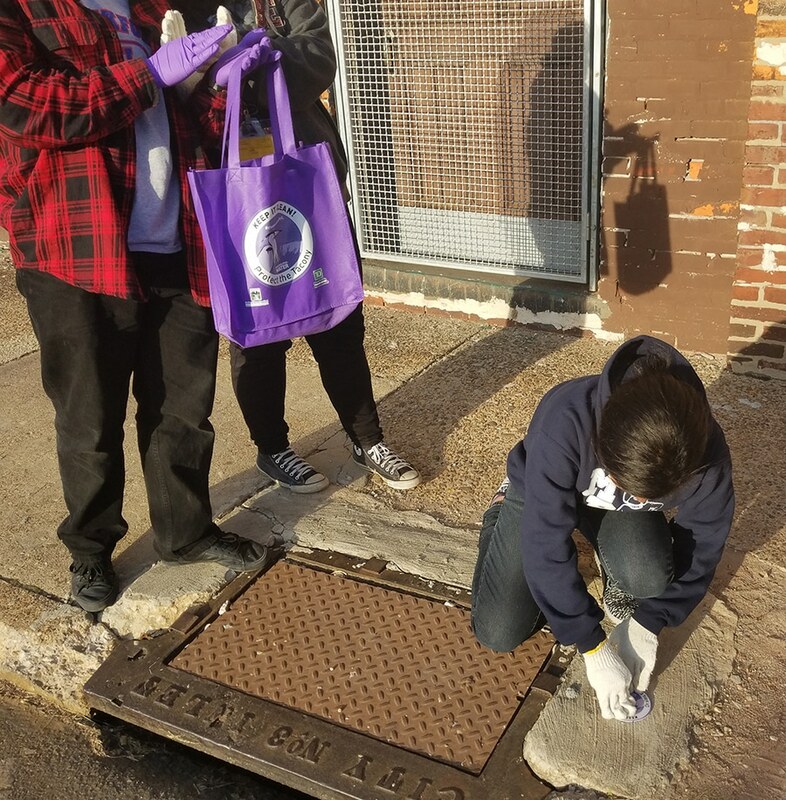 We then hit the streets in our lower Frankford neighborhood and gave a demonstration on how to mark a storm drain. We marked 25 drains along Torresdale Avenue as well as Worth Street, and the blocks between those streets. Students went home with a free reusable shopping bag marked with the great blue heron, our watershed mascot, as well as the TTF logo and the TD Charitable Foundation logo, whichmakes this effort possible! 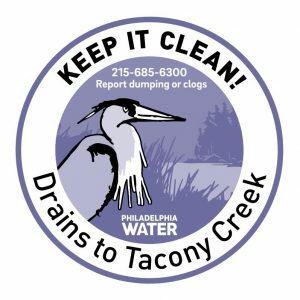 Curbside storm drains are one way that trash and other harmful chemicals can enter Tacony Creek in our city and Tookany Creek upstream, whether it’s washed in by the rain or intentionally dumped there. Marking storm drains reminds people that only rain should go down the drain! It’s also an effective way to protect our creek in a hands-on way. We had a lot of fun marking the storm drains, and community members were happy to see TTF and young people out in the neighborhood, making aneffort to keep our environment safe and clean. 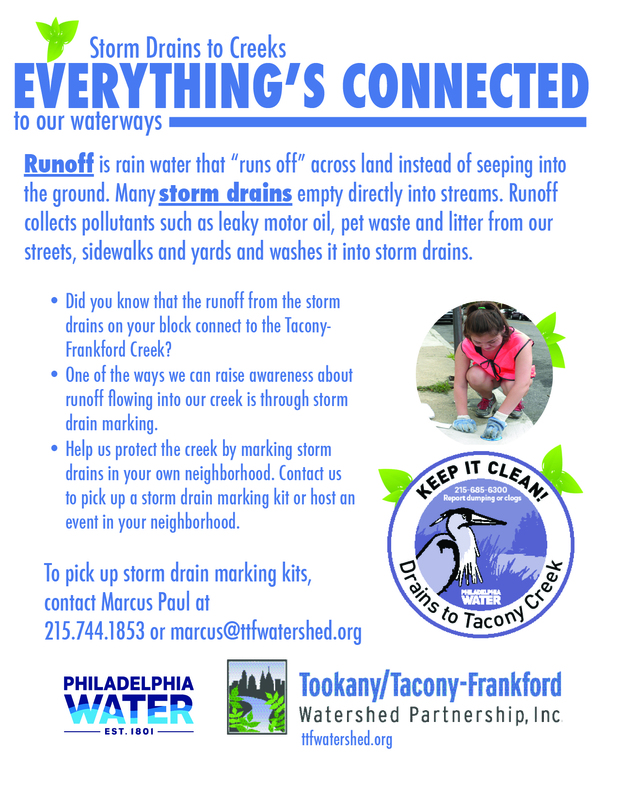 Storm Drain Marking is a program of the Philadelphia Water Department and Partnership for the Delaware Estuary. TTF marks storm drains across our watershed. Interested in leading a storm drain marking event or picking up some markers for the drains in your neighborhood? Check out this flyer and contact Marcus at 215.744.1853. By Daniel J. Welsh, TTF intern and recent graduate of Indiana University of Pennsylvania. 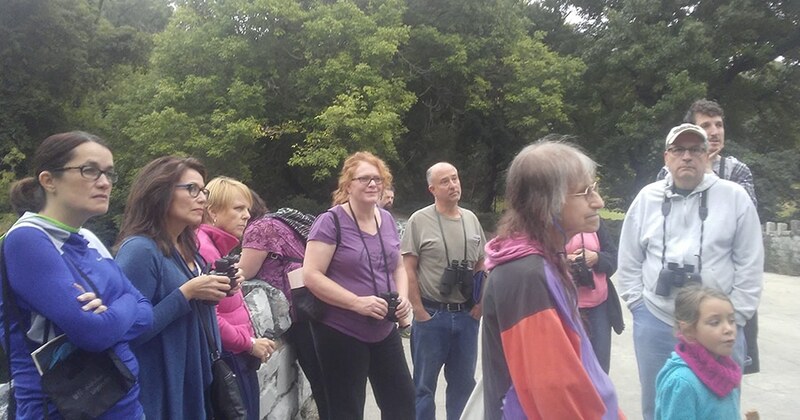 On September 24th, TTF hosted a bird walk in Tacony Creek Park, led by knowledgeable birder Keith Russell from Audubon Pennsylvania. Attendees gathered outside the I & Ramona Gateway around 8 am for coffee and donuts before venturing into the park. The morning was brisk and filled with smiles as everyone greeted each other for this communal event on the 2nd day of autumn! A Canada goose was spotted right from the start. The goose was flying by itself on its migration for the winter. Throughout the walk we saw many flocks of Canada geese flying overhead. Keith explained that migration season is in full swing and birds often migrate during the night. Hawks were spotted as well! It was a sight to see a hawk flying away from a pack of hundreds of starlings. Groups of starlings and other song birds often mob or harass hawks when they are near. Keith’s knowledge and expertise at distinguishing different bird species was so impressive. Everyone on the walk went home with something new they learned. One of the many interesting facts I took away was that bird species were introduced to New York City because people wanted to see the birds talked about in Shakespearean plays! Additionally, I learned that northern flickers have gold on their wings, but in the west have red on their wings. 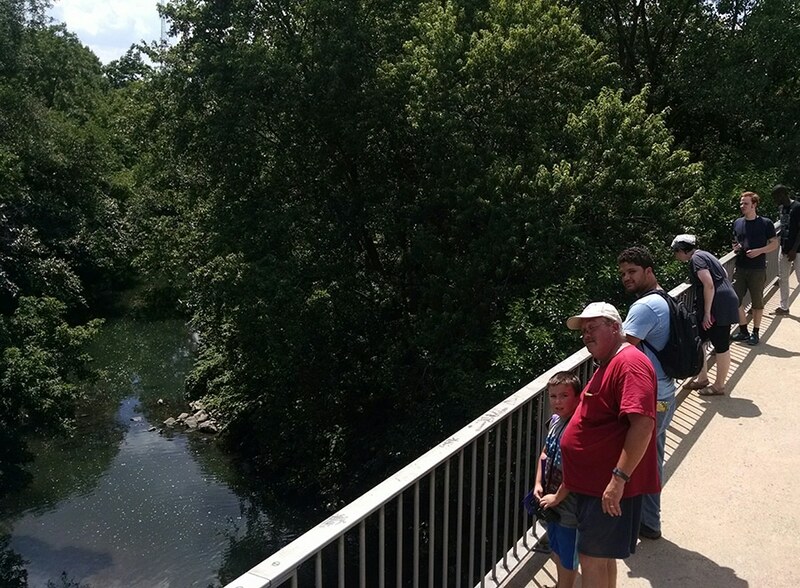 Tacony Creek Park is home to a vast variety of different bird, plant, and animal species. It’s an amazing place to walk through on a fall morning. The sense of serenity and beauty will stay with you throughout the whole day. We have a few bird walks this fall, so visit our Upcoming Events page for more information. Hope to see you there! 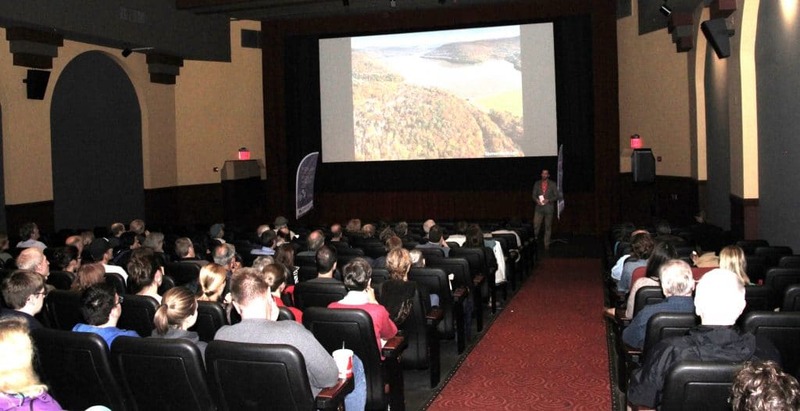 TTF and the Hiway Theater recently welcomed over 100 clean water heroes to our screening of A Watershed Moment, a film about the challenges faced by the Delaware River and how the William Penn Foundation‘s Delaware River Watershed Initiative (DRWI) supports efforts to restore and protect this critical resource. Our audience saw a film about the Philadelphia Water Department’s green stormwater infrastructure program, as well as several of our vimeos. These vimeos, produced by GreenTreks Network, allowed attendees to learn about our upstream creek restoration, as well as our bird and nature programs in Tacony Creek Park. We are so proud to be part of the DRWI! 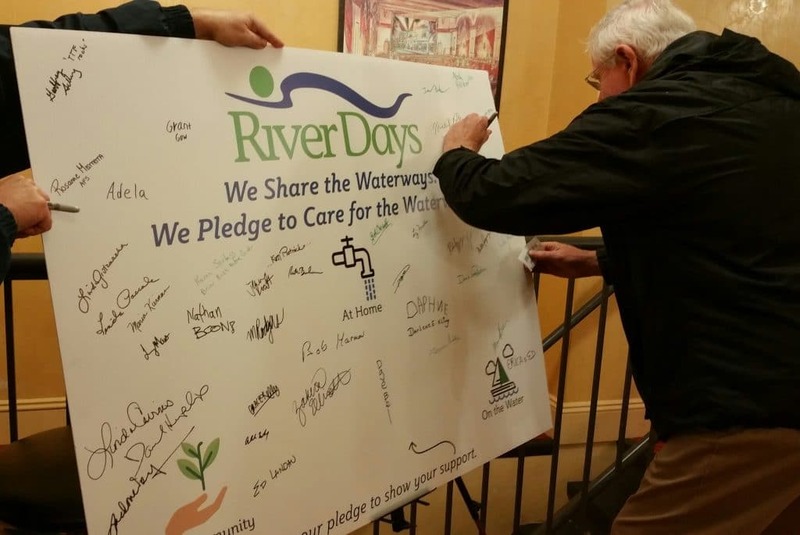 Our goals for this screening were to: inform people about our participation as well as the involvement of partners across the region and the Delaware River basin; inspire attendees to support all of our efforts; and demonstrate this valuable tool for education and inspiration. Attendees included H2O for Life Club members from Abington Senior High School, as well as environmental leaders from across our region including key partners like Abington Friends School, The Academy of Natural Sciences of Drexel University, the Coalition for the Delaware River Watershed, Penn Future, and other watershed organizations. We were honored that Nathan Boon (and family) from the William Penn Foundation welcomed us and shared DRWI background and goals. Thank you, partners and attendees! Please screen this inspiring film (produced by the Open Space Institute) at your local theater, school, business, or home. We’d be happy to host a screening with you! For more information, contact julie@ttfwatershed,.org or 215.744.1853. 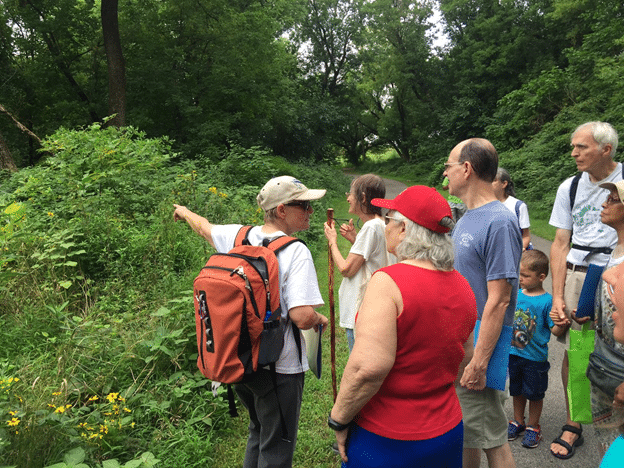 In August, TTF joined Judith Gratz for a morning nature walk where we learned about what affects our watershed systems, and engaged in fun educational activities. We started the day by getting an introduction to what a watershed is and what makes the Tookany/Tacony-Frankford watershed different from others. We learned that while the TTF watershed may stretch over 33 square miles, we are still part of a much larger system. Considering that, we must keep our area as clean and sustainable as we can. 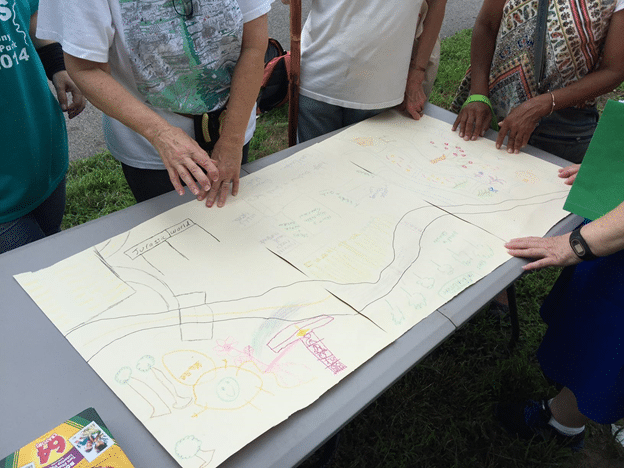 Healthy watersheds mean healthy people, but how do we keep our watersheds clean? Here are just four of the many ways small changes can have a large positive impact. A riparian buffer is a heavily vegetated area along a stream. It plays a key role in improving water quality by filtering and absorbing the rainwater before it reaches the creek. This has a positive effect on plants, trees, and wildlife, providing an improved habitat for those in need. If you live next to a stream, you can easily create your own riparian buffer. All you need to do is let the vegetation by the stream bank grow out by itself. Later you can add some native plants, trees, and grasses. Learn more about creating your own riparian buffer here. A rain garden is a shallow, planted depression that absorbs the stormwater flowing from your roof or yard directly into the soil. It reduces and filters any pollution before it enters the creek by creating an effective and simple to manage landscape. 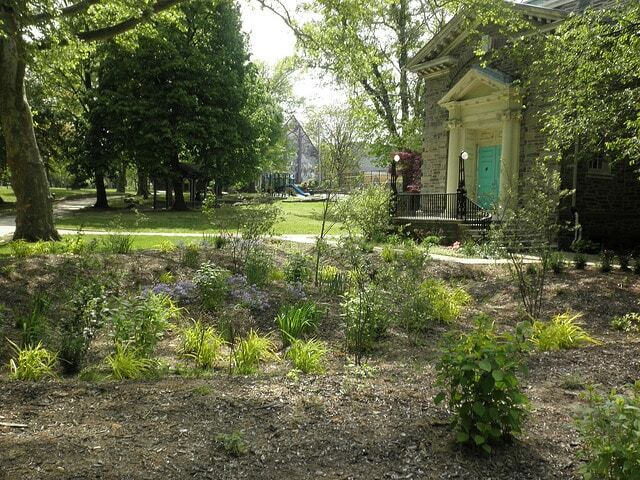 Learn how to build your own rain garden here! Have a driveway that needs to be redone? Or thinking about repaving your back yard? Save some money and do what nature intended by depaving the asphalt and turning it into a lawn or garden. You can also replace existing pavement a pervious patio or walkway which a great and unique addition to any home or landscape. By removing an impervious surface, water is able to be absorbed into the ground. This helps recharge the groundwater aquifers and prevents trash and pollution from entering our storm drains. Rain barrels are recycled plastic containers that help store rainwater from roofs to be reused again. The water saved can later be tapped to water gardens, and wash cars and patios. This allows the owner to not only save money on the water bill but decrease the impact stormwater has on our streams and rivers. 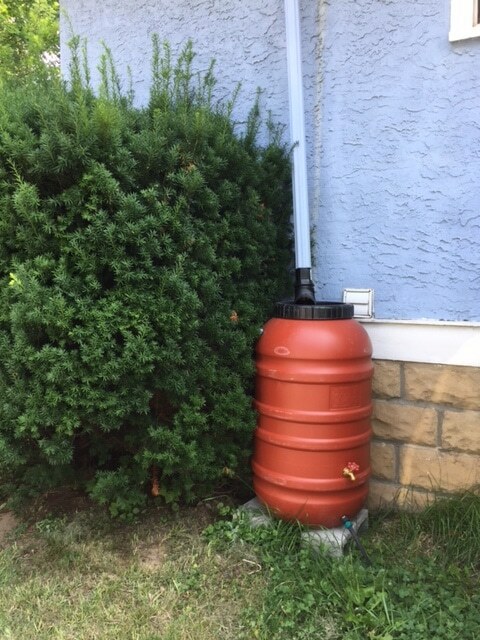 If you are interested in acquiring your own rain barrel you can get a free installation after attending a PWD Rain Check Workshop (must be a Philadelphia resident). Montgomery County residents can order one from TTF! Contact Alex or 215.744.1853. I really look forward to our monthly walk at Tacony Creek Park. It’s really nice to get away from the busy city, even if it’s just for a few hours, and get to learn about all the hidden surprises that nature holds. Judith ended the day with a fun, educational activity focusing on understanding how a watershed may be made up of smaller section, but is actually part of a much larger system. So technically, we all live downstream! Since its release this summer, the Pokémon Go video game has taken the nation (and world) by storm. Curious first-timers and long-time fans of the Japanese cartoon and video game series eagerly downloaded the game onto their smartphones, which then prompted them to explore the outside world in search of virtual creatures. For many playing, the quest to collect all these creatures provided unprecedented motivation to get up, go outside, and walk around the neighborhood! 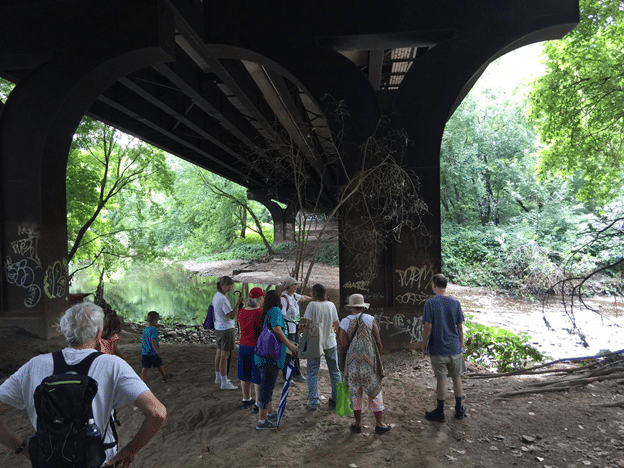 Knowing that this game would get people out of their houses led TTF to host the first ever (to our knowledge) Pokémon Go Safari: a guided walk through Tacony Creek Park, led by our Trail Ambassadors (TAs). 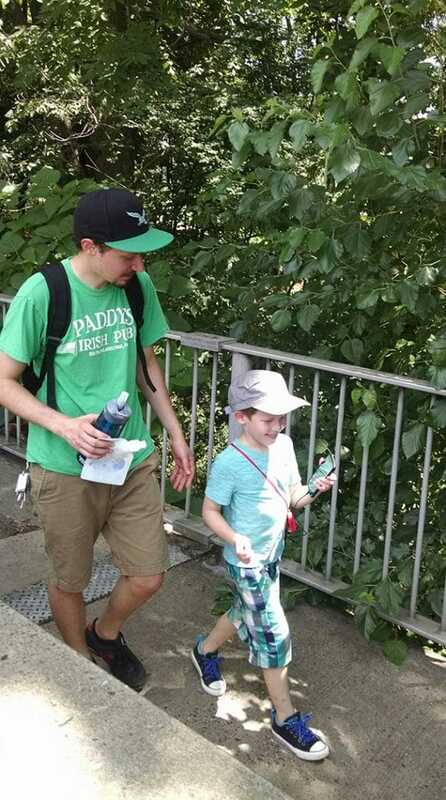 Equipped with binoculars, their Pokémon playing expertise, and their first-hand knowledge of Tacony Creek Park, the TAs guided 16 Pokémon trainers down the trail in search of virtual and real-world creatures. 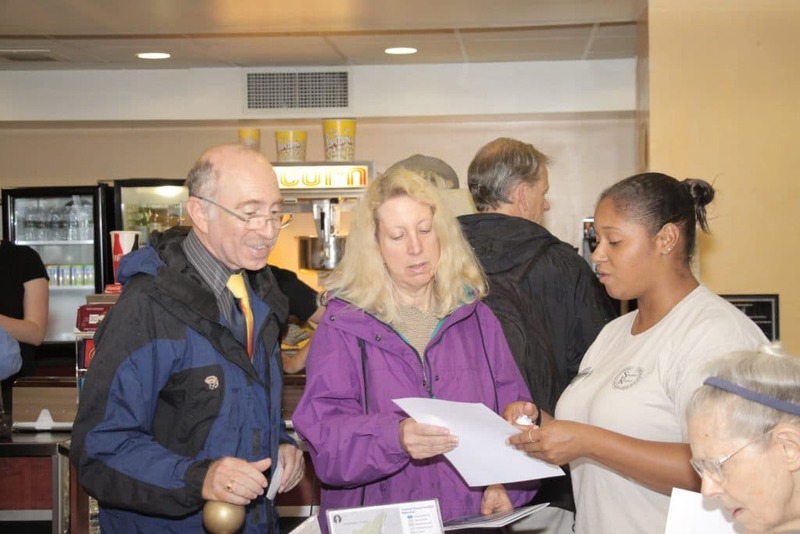 Many participants were first-time visitors to the park! The safari started out at the Whitaker Gateway to the park across from the Juniata Boys & Girls Club, heading down towards the I & Ramona Gateway, walking the trail to Fishers Lane Bridge and swinging back around along Wyoming Avenue. From a Pokémon Go player’s perspective it was very successful: trainers managed to capture a fair amount of Pokemon (21 different species – including a Pikachu!) and visit several Pokéstops to gain items and Pokémon eggs. Two virtual Pokémon gyms can be found along the route, which gave the participants a chance to battle together to gain control of the area for their team. Pokémon weren’t the only focus of the walk though. Along the way many species of birds were seen, including an impressive great blue heron and several frogs and turtles. TTF TAs always enjoy talking with new people about the importance of cleaning up and caring for the creek, and this walk was no different. While everyone enjoyed themselves exploring nature and playing the game, we also managed to gather up 3 full bags of trash from the trail. 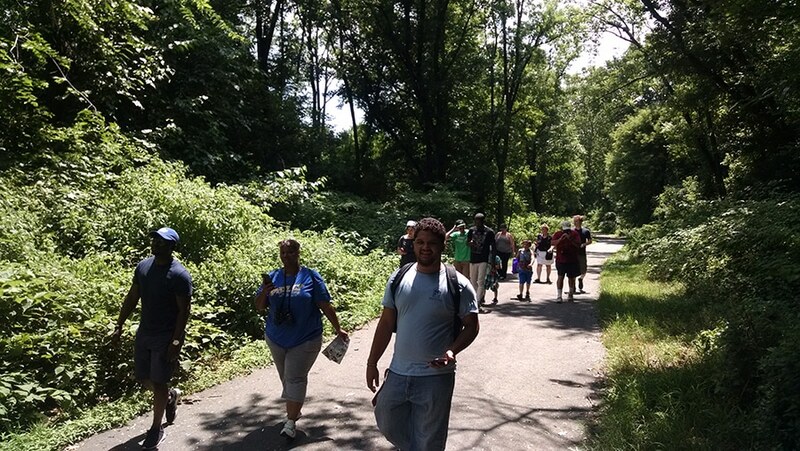 We hope you’ll join us on a walk along the trail, and that no matter how you enjoy Tacony Creek Park – riding your bike, running, or even playing a video game – that you learn to love and care for this wonderful place in our community!